Do you have window condensation or frost? Did the weather suddenly get cold? 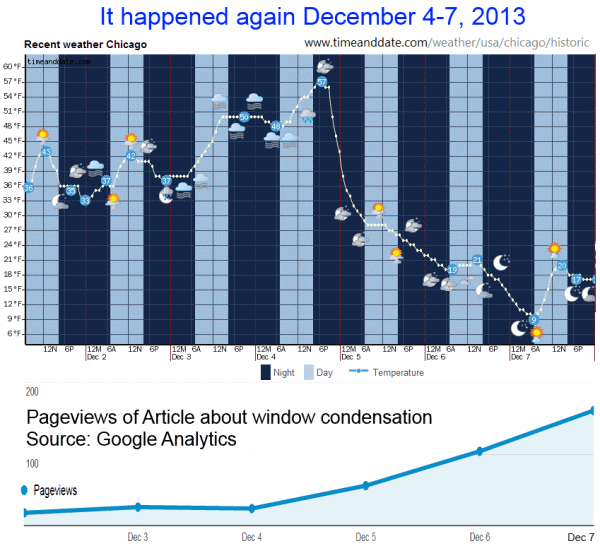 If you have wondered whether window condensation correlates with a sudden snap of cold weather, take a look at this chart. The inset chart shows Chicago temperatures for the week of November 18-26, 2013. Note the big temperature drop on Sunday. 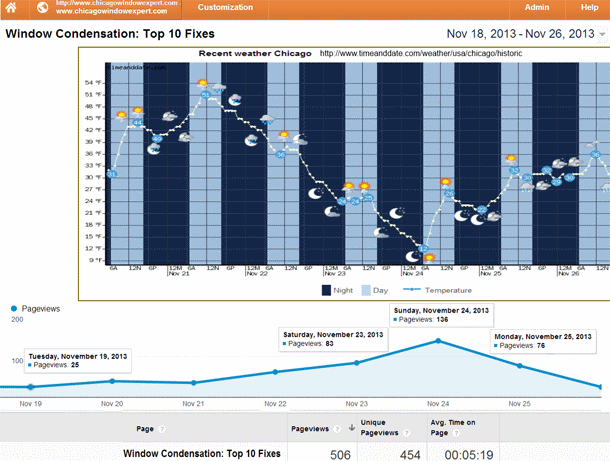 Now look at the traffic on Window Condensation: Top 10 Fixes during the same period. There was about a 500% increase in web traffic from earlier in the week. To show you this isn’t a fluke, it happened again. The temperature in Chicago suddenly dropped between December 5 to December 7, 2013 from 57 deg F to 9 deg F. A 48 degree drop in only two days! No wonder we Midwesterners are hearty and resilient, or is it stupid for living here? 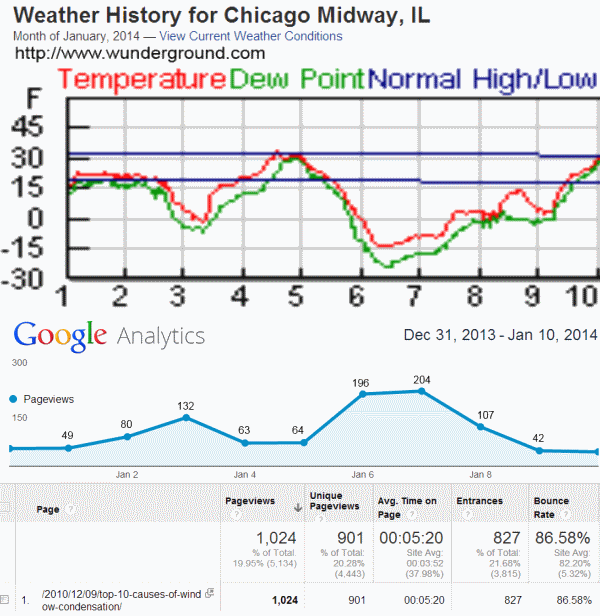 The second Chicago cold snap in 2013 produced the same web traffic results as the first one. As temperatures dropped, people scurried to search online for solutions to their window condensation problems. And our article "Window Condensation: Top 10 Fixes" was waiting with useful information. On January 3rd we had a baby cold snap at around 0 deg F, but it was enough to show up on our analytics. But when the mother of all cold snaps happened on January 6 and 7, with temperatures around minus 15 deg F, our traffic on the window condensation article broke records at around 200 page views for each day. Time on page for the first ten days of January topped 5 minutes per view, which in our ADHD society equates to moving in with suitcases and staying overnight. Why does window condensation and sudden cold weather go together? When temperatures are moderate, the air is capable of holding much more water in a vapor state, so the outside humidity is elevated. This moisture makes its way inside through the building envelope. 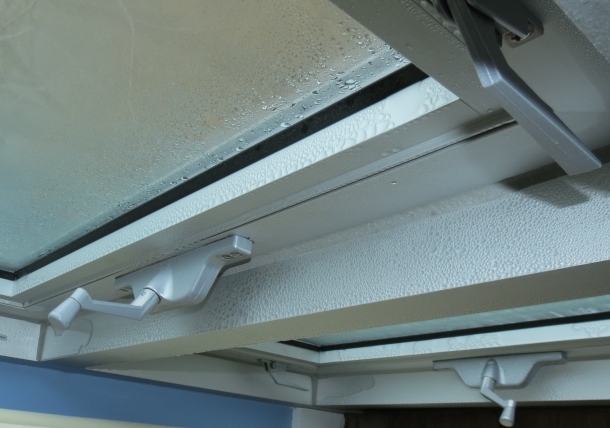 When the temperature suddenly drops outside, the elevated humidity inside the building changes to a liquid state when it comes in contact with the suddenly cold windows, wetting them. This is condensation formation on the windows. Window condensation can subside after you remove some moisture from the inside environment by wiping the windows dry, and then when the inside air dries further because the outside air becomes dryer. Aluminum windows can have more pronounced condensation on the frames because frame temperatures are often lower than on wood windows. Aluminum windows do not tend to self-destruct the way wood windows can, however condensation overflow can harm adjacent finishes such as wood floors and drywall. Aluminum window frames can get colder than wood frames, so they often show a greater volume of window condensation. Your comfort in cold weather is also related to outside humidity. Before the cold snap, you could be really cold outside in 30 degree weather because the water vapor air in the air carries the heat away from your body much more readily than does dry air. After the cold snap, the outside humidity is much less, so it carries your body heat away less. You can feel warmer in 20 degree dry air than in 30 degree humid air. Sounds like people from Phoenix who proclaim the merits of dry heat whilst they shrivel to a prunelike state. Then there’s the effect of the wind, but that’s yet a different subject. 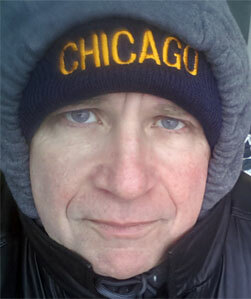 Mark Meshulam, Chicago Window Expert knows what it means to be COLD! When observing testing, I usually have a camera, flashlight, drawings and a phone in close reach.